I’m just about to finish reading Daphne du Maurier’s Rebecca for the sixth or seventh time. I don’t have an exact count, but my daughter tells me that we have at least three copies of the novel in the house. At first, I didn’t notice that this particular edition had extra goodies packed into it: an essay about “Menabilly,” the house on which Manderley (the great estate in the novel) is based, a Rebecca journal of sorts, and, amazingly, the novel’s original epilogue. For the uninitiated (is it possible that you’re out there? ), Rebecca is Du Maurier’s best-known novel, the tale of a rather plain, unnamed young woman who marries a dashing, tragic older man. When he takes her back to Manderley, his magnificent family home, she finds herself, the house and their marriage overshadowed by the memory and presence of his dead wife, Rebecca. Hitchcock made a brilliant film of the novel. But if you’re at all familiar with the novel, you know that its first two chapters are, essentially, an epilogue. Everything that follows is flashback. In the first chapter, the unnamed heroine describes her dream of a haunted, silent Manderly. In the second, she talks of her post-story wanderings with Maxim, her once-dashing husband who is now halting and faded, unable to bear even the slightest mention of the familiarities of home–not even the woodpigeons in Manderley’s woods. By the end of the chapter, she begins the story of how she met Maxim and the mystery begins. The back cover of this edition of Rebecca proclaims that it was the “Winner of the Anthony Award for Best Novel of the Century.” Did you know this? I had no idea, but I think the prize is decidedly well-deserved. There’s something for every reader here: mystery, romance, crime, the paranormal, psychological and real suspense. But I wonder if Rebecca would have garnered such acclaim if it had been published with its original epilogue in tact. It’s a brief chapter, written in the second person–the imagined pov of an observer of the DeWinters in their dotage. All throughout the novel, the heroine indulges in too-frequent internal dialogues about what the people around her are saying, thinking, feeling. It gets to be a tad annoying, and I’ve read it so many times now that she’s begun to sound incredibly neurotic. Sometimes I just want to shake her and tell her that she needs to connect a bit more with reality and she’ll instantly become less anxious. How wonderful life would be if she would just pitch Mrs. Danvers out that boudoir window. Really, no one would care. But I digress. Sorry. I get caught up in stories sometimes. Maxim is shattered, emotionally and physically. Our heroine is less a wife than a nurse and competent companion. And, worst of all, the ruined Manderley is about to be turned into a country club with a golf course and tables for tea set up in the garden. Our heroine has hidden the prospectus for it in a trunk. The actual opening chapters of the novel have only a faint pathos about them, a gauze of mystery. Maxim might still be handsome, though aged by sadness. We’re not sure if our heroine has improved her taste in lingerie, but we are left with hope. (Why it’s important to me that she have nice underwear, I’m not sure. It would have been my very first purchase, had I married Maxim.) Manderley exists in the past for them–It may, in reality, look as it did in her dream, but at least we aren’t forced to visualize it covered in Dorothy Draper chintz, white-jacketed waiters, and squash courts. The actual opening chapters are mysterious, a true invitation and introduction. They make me curious about how these two damaged but content wanderers came to be living so. They tempt me–no, compel me to read on. The editing that turned the original epilogue into the novel’s opening certainly helped to make the novel the masterpiece that it is. One wonders what other magic was worked in various rewrites of the story. Revising. That’s the thing. A new, stronger vision every time. If you were to give our heroine a name, what would it be? dennison69Her name should be Daphne, like DuMaurier. I think that’s what DuMaurier implies. I think there’s a line in Rebecca, in which the the narrator says that people are always mispronouncing her name. Or maybe misspelling it. I mean, “De Winter”… “Du Maurier.” Manderley similar to a house DuMaurier lived in. Just sayin’. I always thought that her first name was something like Martine, a feminine version of a man’s name, because of that conversation. I need that new edition! About a year ago I went looking for my copy of REBECCA for my (at least) annual reread, and panicked when I could not find it. My daughter reminded me that she’d borrowed it on a visit, and I could not believe I’d let her take it out of the house! I have an older copy but now I think I’m going to have to get that one for the extra bits. Ooooooh–Good choices, ladies. So many clues. Maybe! I lean toward the classical or whimsical: Lyric or Athena or Pandora. Dahlia. Daphne would definitely apply. And I confess that I never made the du Maurier, deWinter connection, Dianne. Makes sense. I like that du Maurier simply hadn’t yet given her a name, and then it got to be kind of a challenge to finish the book without one. Clair, when it’s not 1 a.m. and I’m not covered in paint, I’ll look up the ISBN. Can’t find the cover online–or the goodies. ADHD brain has no memory of where this version came from. Movie stills–gorgeous! http://hookedonhouses.net/2010/04/11/rebecca-going-back-to-manderley-again/ Fun blog, too. If her name was actually Rebecca, it would have given Mrs. Danvers added reason to hate her, plus it would have given us a reason for Maxim to have married her. Lovely post! I’m going to have to reread that epilogue. I’m really excited about reading this edition, but could you give us some more information: year, publisher, etc? I don’t want to read the whole post, because I’m trying to avoid spoilers. Thanks! You can put it straight into Amazon or BN search and something will come up. This edition appears to have first come out in 1997, w/ reprints in ’01 and ’06. I put the # into Amazon and checked the available back cover to make sure it included the add’l material. The latest cover is different from the one I have. 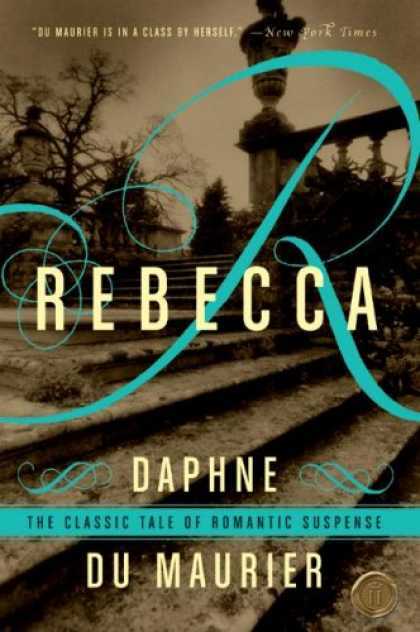 Just read “Rebecca” for the first time on recommendation of a friend – great book! Just finished the book. Loved it. I wasn’t sure about the end-Was Manderley on fire? I just requested the movie from the library. Can’t wait to get it.